Summary: Seven Wainwright Fells are completed on this challenging circular walk of just under nine miles. 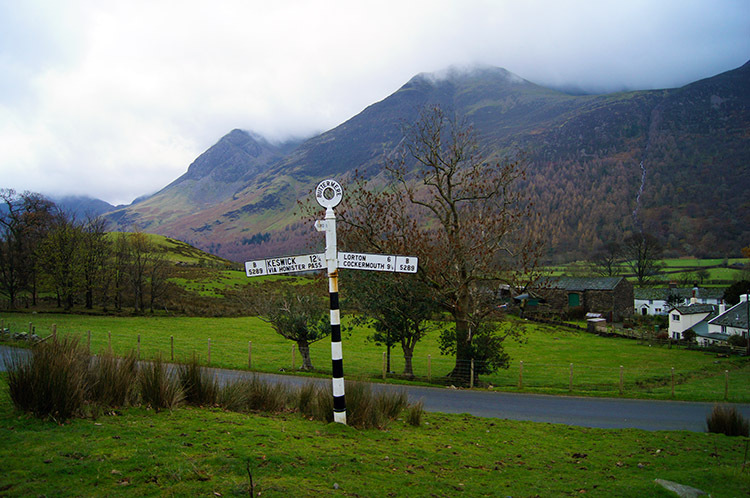 Start by following the road from Buttermere to Newland's Hause. 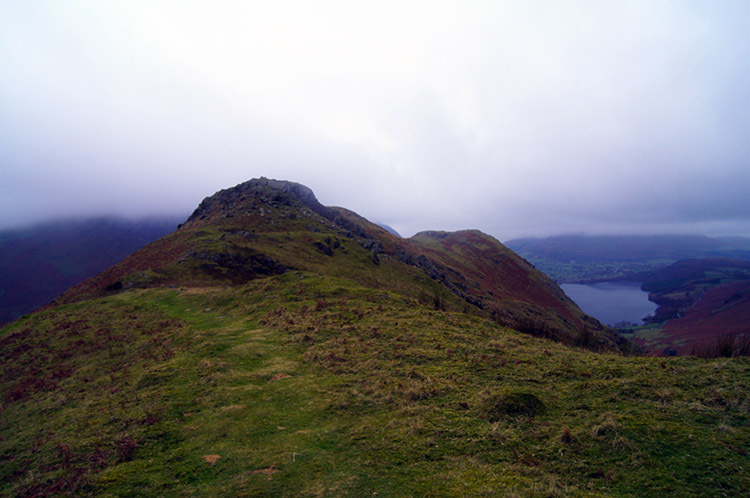 After the Knott Rigg/ Ard Crags ridge and the descent to Sail beck there is a tough climb up to Sail and then it is high level walk until Rannerdale Knotts before returning to the start. 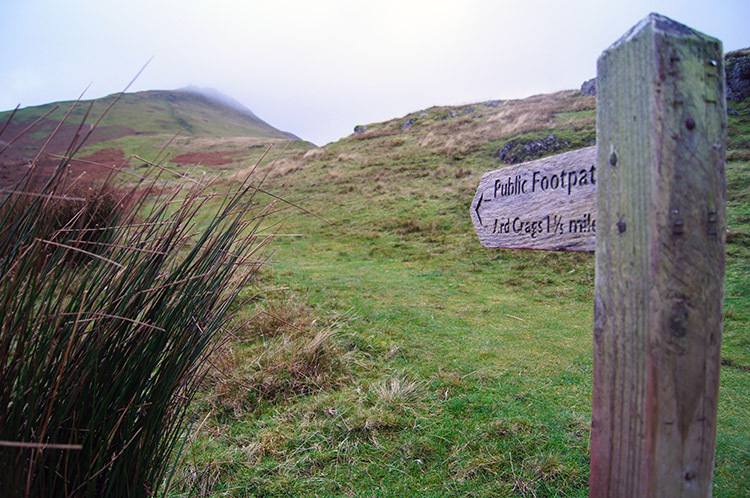 It is always nice to walk in the western fells of the Lake District as it is quite a journey to reach them from North Yorkshire; the eastern and central fells are nearer to my home and I often plan walks on these especially when I have travelled the same day and more especially in winter when daylight hours are less. 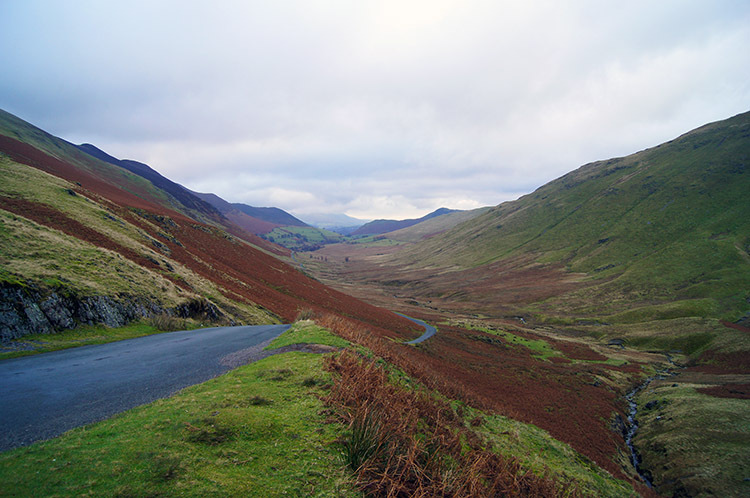 So I decided to go to the Lakes for three days in November 2013 and dedicate three walks to the fells in the far west. This walk was the middle one. 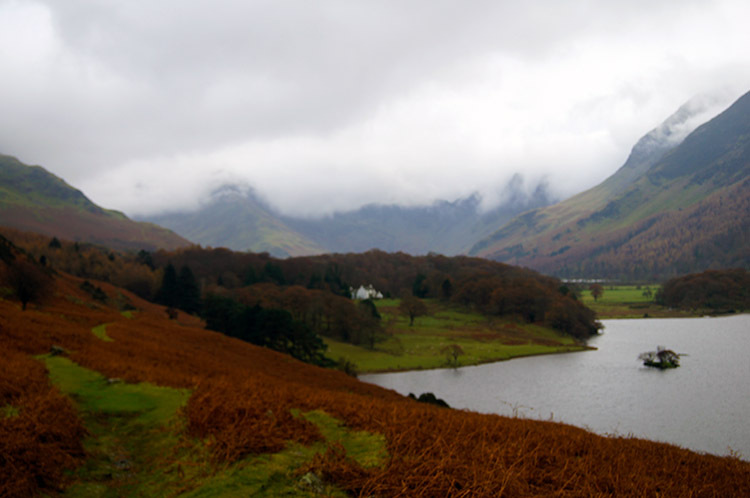 I stayed in Keswick and after the earliest breakfast possible in my accommodation I drove to Buttermere village, parked up and set off on my way at precisely 9.00am in the morning. My friend Tim Nobes joined me for the first half of the walk and he influenced the first stop on the walk, one before we had even left the village. It was to St James Church in Buttermere we went to take in the view of Haystacks from a particular church window which has a memorial to Alfred Wainwright set in the window recess. 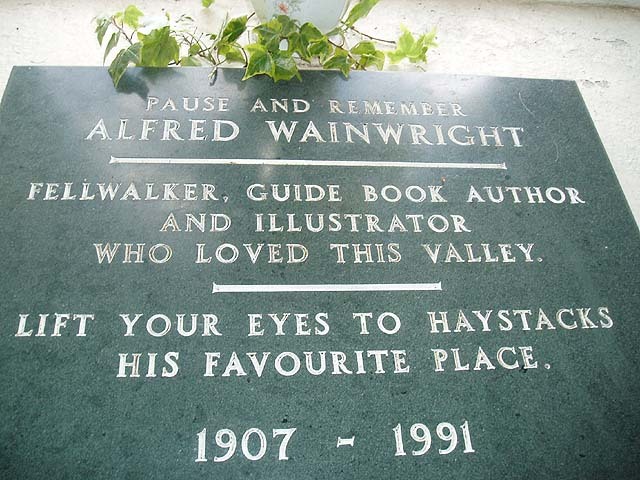 It read 'Pause and remember Alfred Wainwright. Fellwalker, guide book author and illustrator who loved this valley. Lift your eyes to Haystacks his favourite place. 1907-1991". 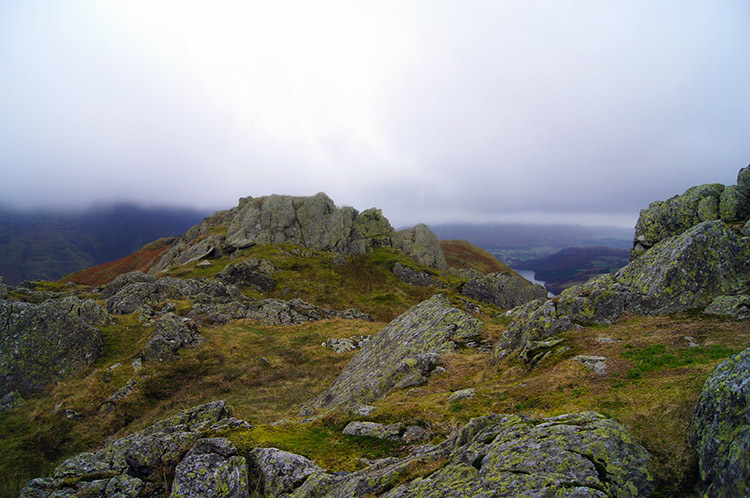 As suggested I lifted my eyes and thought of the summit of Haystacks. Then after a moment of contemplation Tim and I left St James Church and set off on our way in a direction away from Haystacks by following the Newlands Hause pass road eastwards to Moss Force. It was a steady climb by the side of the upland road and in the 1.2 miles of walking beside it we ascended 200 metres to the high point of the road at Newland's Hause. In summer there are always cars parked at this vantage spot with some of the car visitors making the short easy ascent to Knott Rigg and Ard Crags the first two Wainwrights on my route and other car visitors taking the short walk to get close to Moss Force, a near 100ft waterfall which flows from the slopes of Robinson. 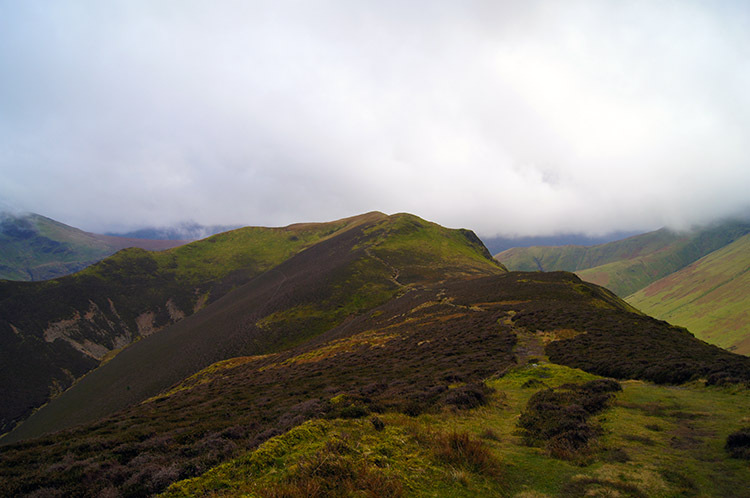 It is quite a sight to enjoy which we did for a minute before we turned away and began the ascent from Newlands Hause to Knott Rigg. 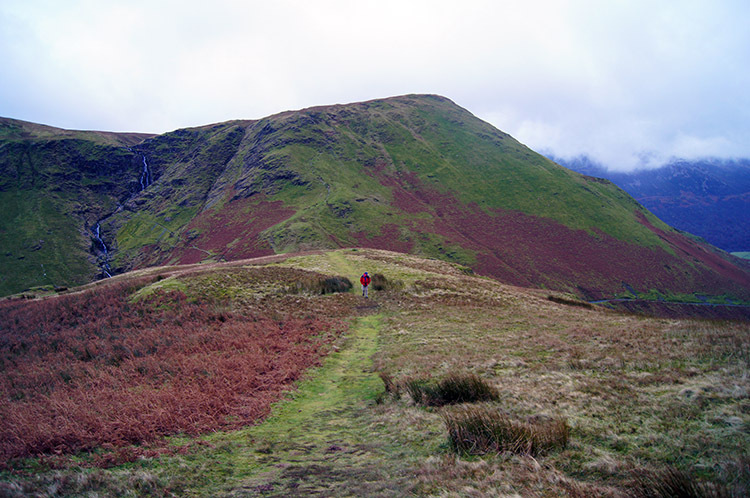 It is a fine walk from Newlands Hause to Knott Rigg, the first half being a climb of about 120 metres to the western end of the superb long 2 kilometer long ridge which ends at Ard Crags. I scuttled my way up to the ridge with good pace and Tim who had been rearranging his walk wear followed me up closely behind. I stood on the west end of the ridge and waited, looking back to Moss Force as he caught up with me. The clouds continued to race across the sky just above us. 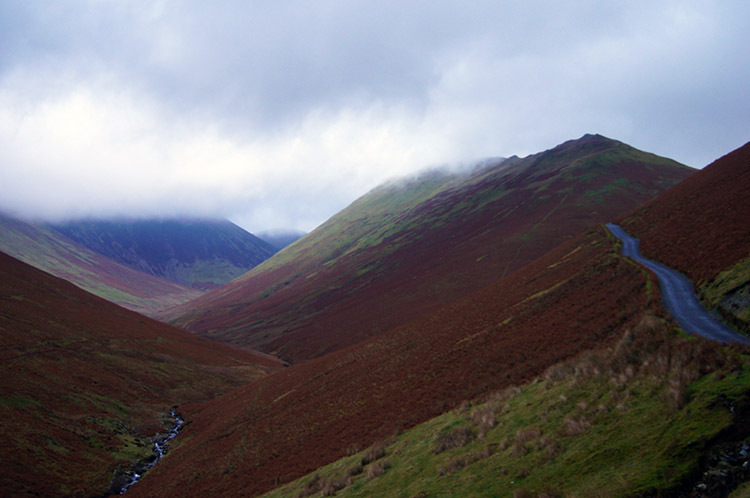 Wainwright said of the moment once the ridge is reached from Newlands Hause "Upon reaching the ridge there is at once a fine view down the other side of Sail Beck and across is the tremendous scarred wall of Wandope, Eel Crag and Sail". The view I got of Sail Beck was exactly as described, the rest of the view intermittent as cloud raced across the elevated ground and often blanking out the view completely. Still the view ahead along the ridge was superb as it defiantly ducked below the cloud. 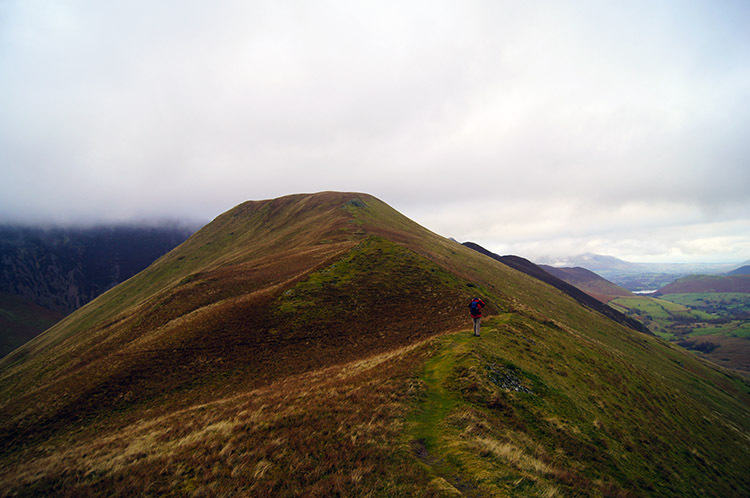 It is just as well the ridge is so lovely as the views outwards from its western end and from the summit of Knott Rigg are not that engaging with few Lake District summits to make out. 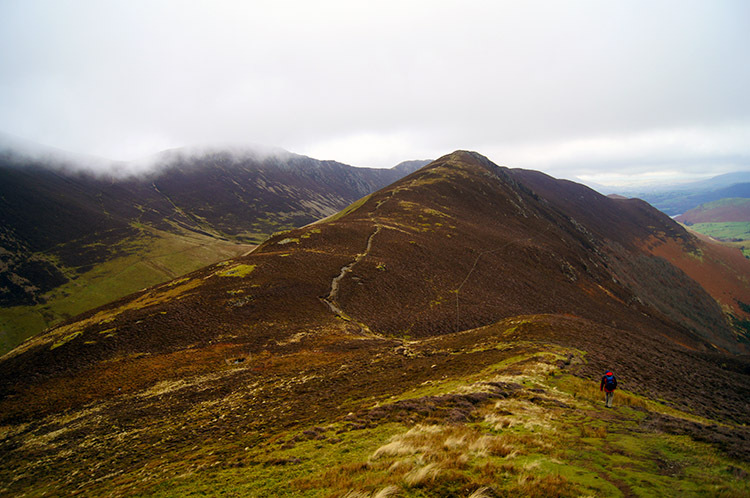 It is that this section of the ridge is tightly sandwiched between two higher mountain lines, the Wandope to Sail line I would stride over later on this walk to the north west and the Newlands Robinson to High Snab Bank line to the south east. Anyway, any further inspection of distant fells was prohibited by the cloud. 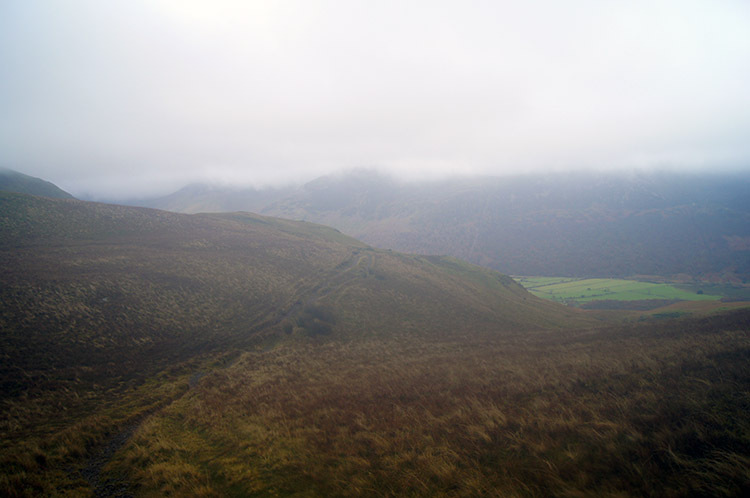 However the east end of the ridge is a different matter entirely and at Ard Crags Wainwright eulogises "The highlight of the view is the beautiful detail of Newlands, a picture of bright pastures intermingled with heathery ridges, backed by the Helvellyn range, which is seen end to end in the distance". Oh what a thought. Tim had completed his task for the day and he had to get back home for parental duties so we descended from Ard Crags straight down the north west facing slope to the source of Rigg Beck. I should have bid him farewell then and climbed straight up the south east bank of Sail. 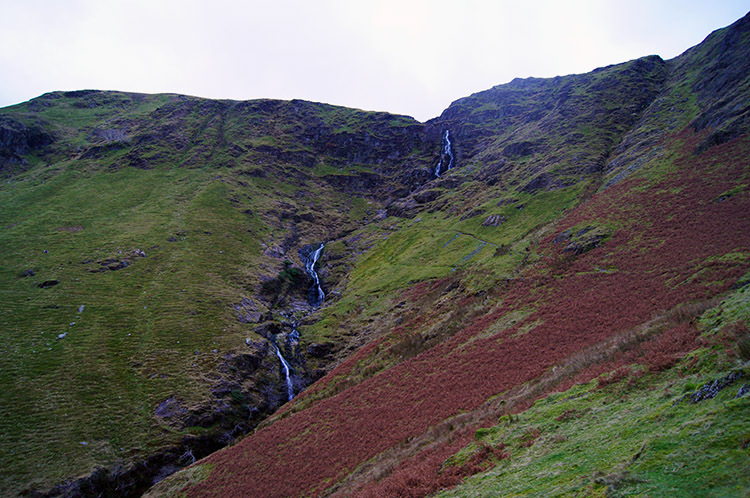 However as he made his way back towards Buttermere by crossing the saddle to the source of Sail Beck and then continuing on the path following the beck downstream I accompanied him, losing 50 metres of hard earned altitude as I did so. Eventually I halted, shook his hand near the point where Addacomb Beck flows into Sail Beck and bid him farewell. I then looked straight up Addacomb Beck and began the steep arduous ascent to Sail, a climb of 350 metres at a 50% gradient. It was very hard work from the start. 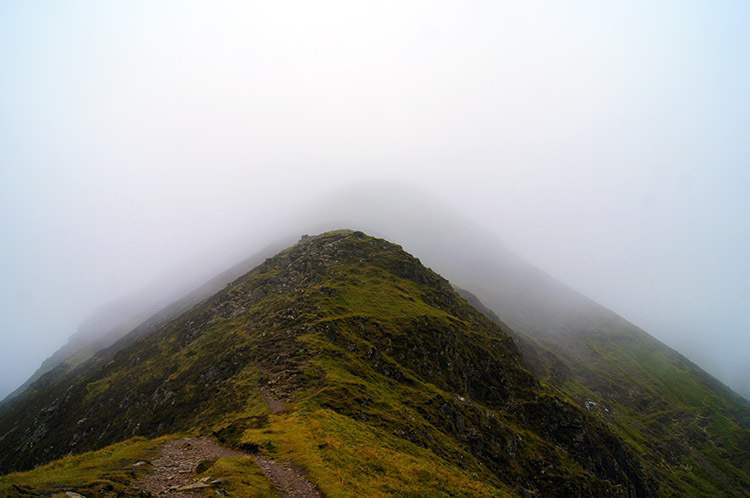 I heaved my way up the steep slope on a true north line towards the summit of Sail. The bursts were longer at the beginning of the climb than those toward the end; about 50 steps to a break as I began with short breaks and then about 20 steps as I finished with longer breaks. In the early stages of the climb I looked back down to Sail Beck and watched Tim as his image reduced in size until it eventually faded. 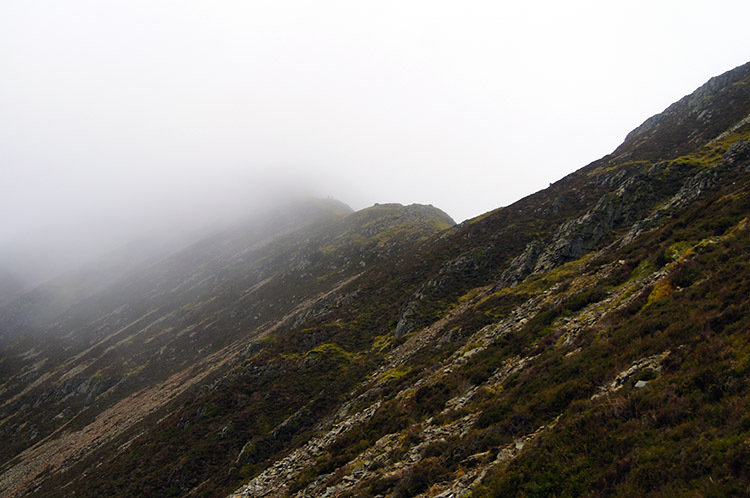 Then as I got to about 600 metres I focused on three walkers on the ridge above near Crag Hill/ Eel Crag though their forms too faded as I reached the line of cloud. After 1 hour and 20 minutes of climbing 350 metres and covering 700 metres I reached the summit of Sail, emerging dead on the summit with more luck than judgement. 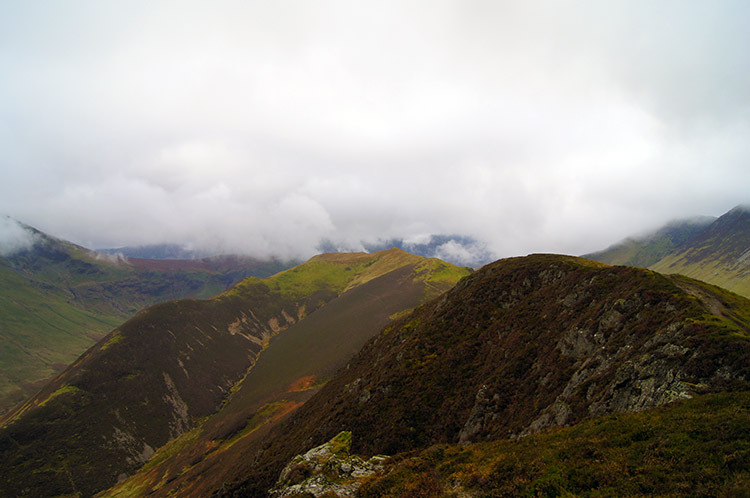 My short moment on the summit of Sail could not have been in more contrast to the last time I had stood on the spot during a glorious warm summers day when I did the Coledale Horseshoe walk. This time it was damp, cloudy and utterly miserable. With nothing to see I marched on towards Crag Hill and then after patting the summit trig point I marched on to Wandope. The cloud persistently stayed in place and even reached out droplets of rain which had not been in the fair weather forecast I had been promised. 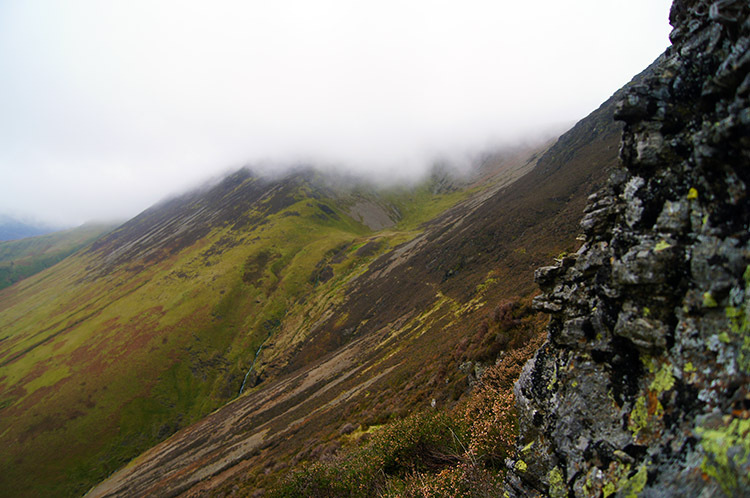 Crag Hill I had enjoyed before but Wandope not so again I rely on Wainwright to explain what I should have seen. He said "Pride of place must be conceded to the Scafells, from here looking magnificent, but scarcely less impressive is the scene eastwards, where range after range of tall fells cross the line of vision to culminate finally in the long Helvellyn skyline. The head of Sail Beck is a striking feature far below..." Sigh, I could not see beyond my nose. The conditions continued to be miserable, an unabated clag and enough to render my camera useless for a while as it steamed up the lens. 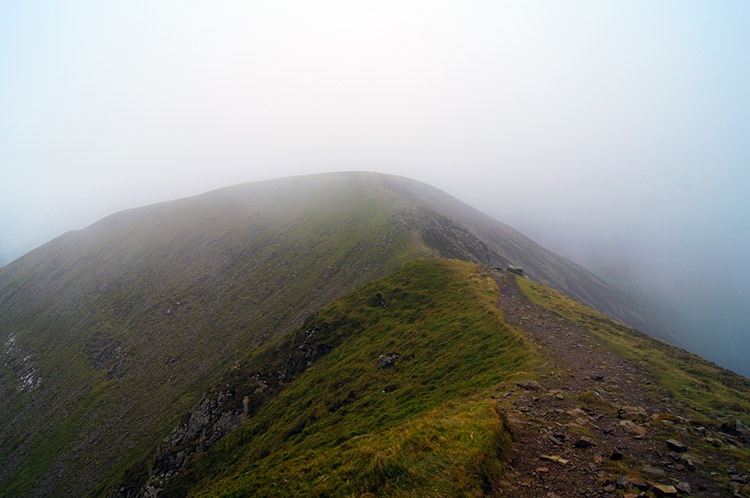 I have photographs of Whiteless Pike, my next Wainwright fell but they are a messy blur and anyway I did not dwell there, simply riding the summit to find the descent path to Whiteless Breast. I strode wearily down the path, cursing as I stepped down the non uniform footfalls along the path. The lack of vision in such a walk tires me and all I wanted were views again. After what seemed an age of descent, but in fact being less than 15 minutes I reached the cloud line once more and stepped below it into a spectre of view. EUREKA!! I was immediately heartened and reinvigorated. What is more the views unfolding before my eyes were remarkable and got better as I further descended Whiteless Breast. 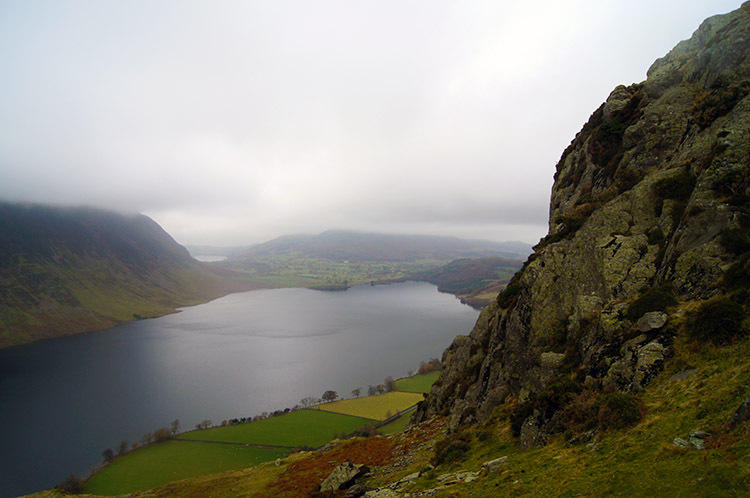 The detached lump of Rannerdale Knotts and Crummock Water dominated. Energy grew in me as I continued and it needed to. When I had been on Whiteless Pike I had despaired, another great view promised but scotched and with the despair and accompanying disappointment I had all but given the walk up, even deciding to bypass Rannerdale Knotts for another day. But now I could see them and the isolated bulk of the small mountain shouted to me "Come here!". I just had to answer the call. 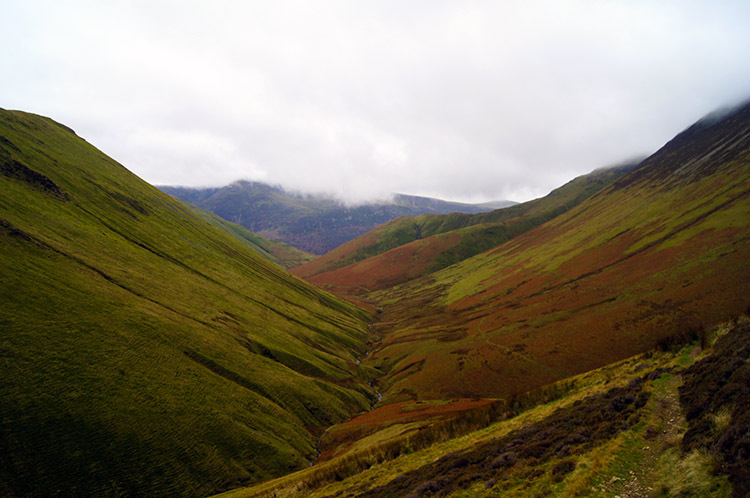 And so I proceed with haste once more to Rowantree Beck and across to the eastern foot of Rannerdale Knotts. I then fairly bounded up the slope to Low Bank. 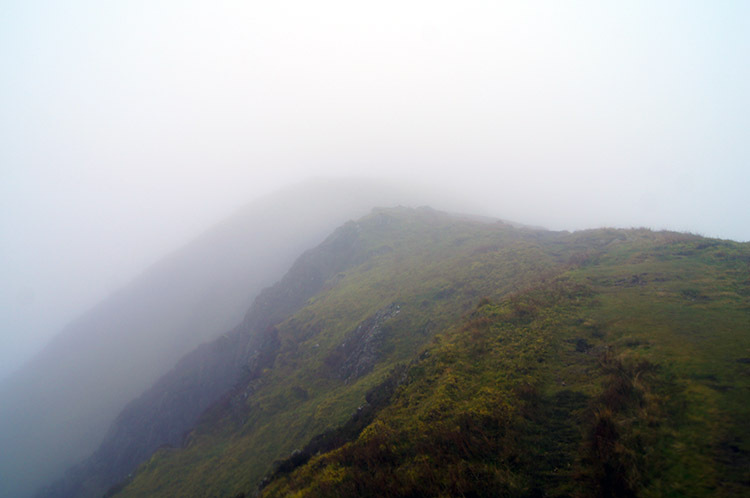 And then I walked on from Low Bank toward the summit. 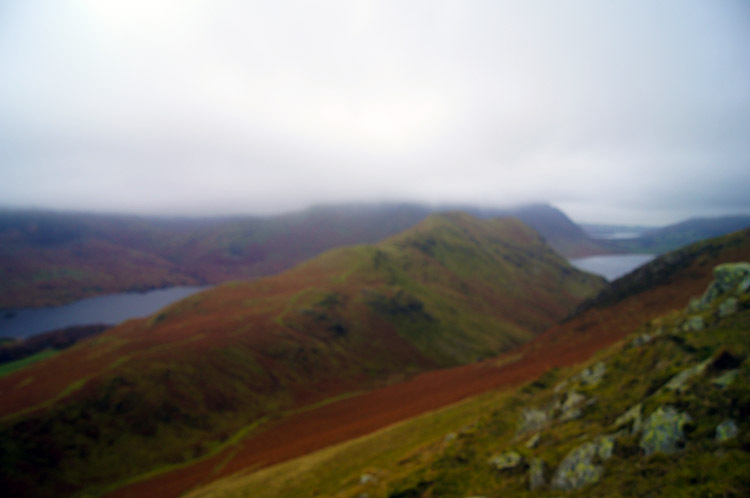 I loved the walk on Rannerdale Knotts. Once at the craggy summit I sat and admired the view I was now enjoying, a sublime view of the Buttermere/ Crummock Water valley with both lakes in view. It was a remarkable calming time and I could have sat for ages. I did sit and take refreshments but the chill of the November day beckoned me to call a halt to the view and it was now approaching three in the afternoon. Night would fall soon. So I descended carefully from Rannerdale Knotts to the south side of the mountain and followed a good grass path to the road from where I walked back to Buttermere. It had been a great first third of the walk, a miserable viewless middle third and a soul reviving final third. "What? of course I would do it all again".